JD and Candace Asbell are one of the top five franchisees in HomeVestors of America's history. They are achieving financial freedom and a good work life balance as they grow their company. JD shared his franchise experience with Franchise Business Review. What specific business advice do you have for franchisees when it comes to succeeding in franchising? I see so many people buy a franchise and then try to re-invent the wheel. You will likely need some creativity in your business, but you need to be able to follow the system that has been proven to be successful. What are you most proud of when it comes to your career in franchising? We have been a top performer in the HomeVestors of America network since the beginning. We follow the system provided to us by the franchisor and strive to always do the right thing. We never cut corners or jeopardize our integrity to get more business. Our business, CityScape Properties, was honored to receive HomeVestors top honor, “The Founder Award”, which signifies integrity and teamwork. I was a corporate sales manager traveling around the country every week. I wanted to be my own boss and quit living on the road without my wife Candace and our four young children. How did you decide upon franchising I was a corporate sales manager traveling around the country every week. I wanted to be my own boss and quit living on the road without my wife Candace and our four young children. Candace and I were in a similar business part-time on the side buying rental properties when we came across HomeVestors. It seemed like an opportunity to quit my corporate job and build the business Candace and I were starting slowly on our own. We met with a couple of HomeVestors franchisees and kept hearing the words integrity and loyalty. A few weeks later we were in Dallas meeting with the founder, Ken DeAngelo, and his team. We could tell from our time there that HomeVestors was comprised of a dedicated team that understood they were only as good and successful as their franchisees. Integrity is not just a word on the wall at the corporate office, it's a way of doing business for HomeVestors Corporate team. 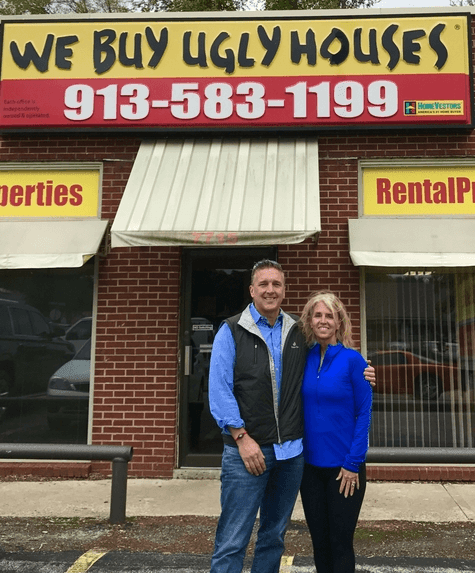 JD & Candace Asbell are able to spend more time with their kids and each other as a result of investing in a HomeVestors of America franchise. Why did you choose the franchise brand you did? We selected HomeVestors because of the integrity that came from the top. The franchisor understands that this is a people business and they treat the franchise team with respect. HomeVestors is always willing to help franchisees grow their business. Our success matters to them. Integrity is not just a word on the wall at the corporate office, it's a way of doing business for HomeVestors Corporate team. What kind of support from your franchisor has contributed most to your success? HomeVestors offers training and support for its franchisees from day one. From corporate training, to field training, to regional summits, to national conventions, Homevestors understands that building its franchisees is the key to a solid and successful business. Starting up and building a business is not a short-term process, it takes years. HomeVestors understands this and that its franchisees need time, support and encouragement. I am able to pick up the phone and call the President, the Marketing director, or Accounts Payable and they all answer their phone. How do your fellow franchisees help you succeed? We have met other national franchisees at conventions and summits and masterminds that have been organized by the franchisor. These meetings are designed for the franchisees to share best practices and grow their businesses. HomeVestors does an excellent job at letting the experienced and successful franchisees speak and train at these meetings and events. HomeVestors also allows and sets up events like masterminds and summits for franchisees who are at the same level of success so they work together to sharpen their skills. We also work together as a team of franchisees within our city to ensure that we’re generating and following up on the leads that we receive through the HomeVestors' marketing system. It’s great to be able to discuss local dynamics with other local franchisees. By joining HomeVestors, following the system, and growing our businesses, Candace and I are obtaining financial freedom. Has franchising met your personal and financial goals? Yes. By joining HomeVestors, following the system, and growing our businesses, Candace and I are obtaining financial freedom. We have been able to build a team to support our franchise, which allows us to get away from the business, take vacation, and attend mission trips. We are also able to give back to help organizations that help people. Candace and I agreed when we started our HomeVestors business that it would be “family first” and that we would take care of our employees like family. We have adopted FAIR, FIRM, AND HONEST as our identity on how we treat customers and employees. This has served us well and will continue to be our motto as we look toward our future growth and success with HomeVestors. JD and Candace carefully reviewed the HomeVestors of America opportunity prior to investing in it. To facilitate your research, we pulled together the information below. To see how HomeVestors of America's franchisees rank it in area’s that are crucial to the health of a franchise including leadership, culture, and training, read its full franchisee satisfaction report. For more information about franchising with HomeVestors you may call (800) 704 6992 or visit HomeVestorsFranchise.com.